Avalon has a fully independent suspension with a stabilizer bar for a smoother, more comfortable ride. And Touring's unique suspension adapts to the road for a more dynamic driving experience. Step on the gas and feel the rush of the 3.5-liter V6 powered by 268 hp and 248 lb.-ft. of torque. Even with all this power, the engine is still incredibly efficient with an EPA-estimated 31 mpg highway and Ultra Low Emission Vehicle (ULEV) certification. 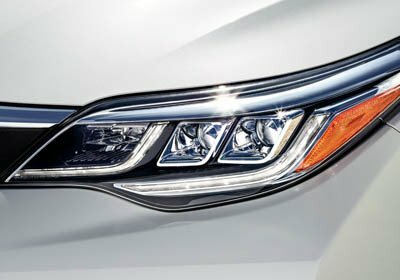 At night you’ll truly shine with available LED (light-emitting diode) headlights and LED Daytime Running Lights (DRL) that switch on and off automatically. 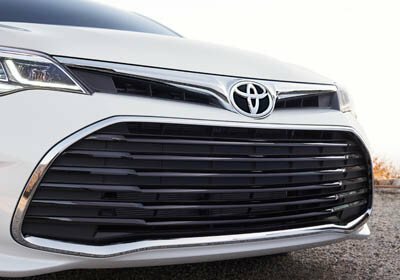 The attention-grabbing grille with chrome accents gives Avalon an unmistakable look. A complement to the already stylish exterior, the available 18-in. dark gray painted alloy wheels take Avalon Touring to the next level. When you step inside Avalon, you turn off the world around you. An acoustic noise-reducing windshield and driver and front-passenger side windows soundproof the cabin, creating a quiet retreat. Your rear-seat passengers ride in comfort as well. The spacious available heated rear seats of Avalon offers plenty of leg room thanks to a near-flat rear door. Avalon's cockpit is tailored to you, the driver. Its available 10-way power-adjustable driver's seat is a near-custom fit. It also features an available power seat extension for added leg support. Avalon Limited adds Black perforated leather-trimmed heated and ventilated front seats for added comfort. Avalon's standard leather-trimmed seats, soft-touch materials, and French stitching add up to an environment that feels as if it was made just for you. Subtle design touches make sure that the interior of Avalon stands out. A luxurious ride for everyone: Avalon Limited is equipped with a power rear sunshade to help keep rear-seat passengers cool and comfortable when the sun is at its full strength. Ambient lighting throughout the cabin of Avalon Limited lends a touch of warmth and elegance and also makes it easier to locate frequently used items like cup holders and door pulls when it's dark. Avalon comes standard with a total of ten airbags, including a driver and front passenger Advanced Airbag System, driver and front passenger seat-mounted side airbags, driver and front passenger knee airbags, rear seat-mounted side airbags, and front and rear side curtain airbags. Avalon comes standard with the Star Safety System, a suite of six advanced safety featured designed to help keep you out of harm's way. The system includes Vehicle Stability Control, Traction Control, Anti-Lock Brake System, Electronic Brake-Force Distribution, Brake Assist, and Smart Stop Technology. Avalon's Pre-Collison System with Pedestrian Detection (PCS w/PD) combines millimeter-wave radar with a camera capable of shape recognition, helping you and pedestrians stay safe. When activated, an audible warning and a display notification will alert you of a possible collision with a pedestrian under certain circumstances. If you don't react, automatic braking and collision-avoidance support are then utilized to help prevent a collision from happening. Automatic High Beams (AHB) help enhance visibility when driving at night. The system is designed to detect oncoming vehicles up to 2000 feet away, automatically switching the high beams off in certain circumstances. When the road clears, AHB switch back on, helping you see more clearly in the dark. Lane Departure Alert with Steering Assist (LDA w/SA) helps you stay in your lane using a specialized camera that's designed to detect visible painted lane marking on the road. If you start to drift out of your lane, an audible beeping sound and indicator light on the instrument panel will alert you so that you can take corrective action. Dynamic Radar Cruise Control (DRCC) automatically adjusts vehicle speed to help maintain a preset following distance between you and the vehicle directly in front of you.